I can’t even begin to tell how much I love this application. I think I love it as much or MORE than Datacad! Media Center is the successor to J Rivers Media Jukebox. This is in my opinion, the best Media managment program around. 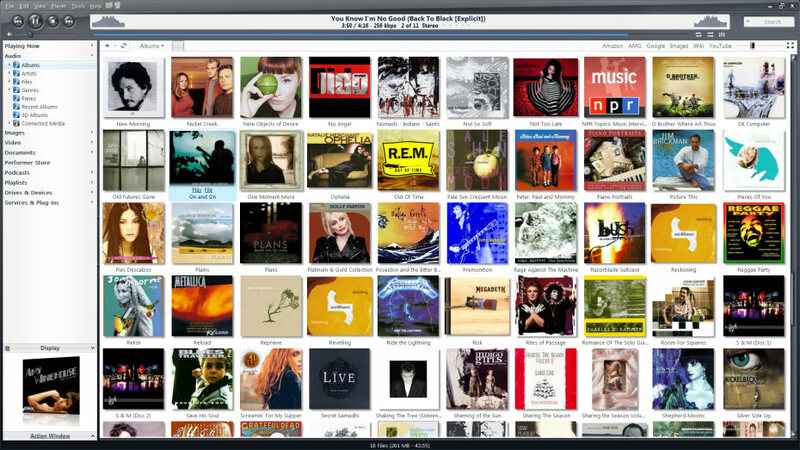 I’ve used Windows Media Player, Music Match, and a few others, but have fallen in loved Media Center. It’s handles everything! Enables streaming of all my media to my droid or anywhere there is a DNLA box. It is also IPod / Phone compatable so you can leave cruddy Itunes behind for good! (Except when you need a firmware upgrade) They have Amazon’s and their own built music in store for buying music the was it’s supposed to be bought online at much higher bitrates. Visit http://www.jriver.com/ to download a free 30 day trial! It uninstalls nice & clean if you decide not to keep it. Music, photos and video YOUR way — all from a single software program! Connect your PC to your home entertainment hardware and control it all with a remote! Load your music on your iPod while you watch TV! All with one easy-to-use program — MEDIA CENTER! Copy music from MEDIA CENTER to a portable digital audio player or move digital camera photos into MC’s powerful image library. Make a CD of music for your car. Record your favorite shows and watch them on your TV. More than one soundcard? Play different music simultaneously in different rooms. MC’s Media Server can even stream your music to your PC at work!